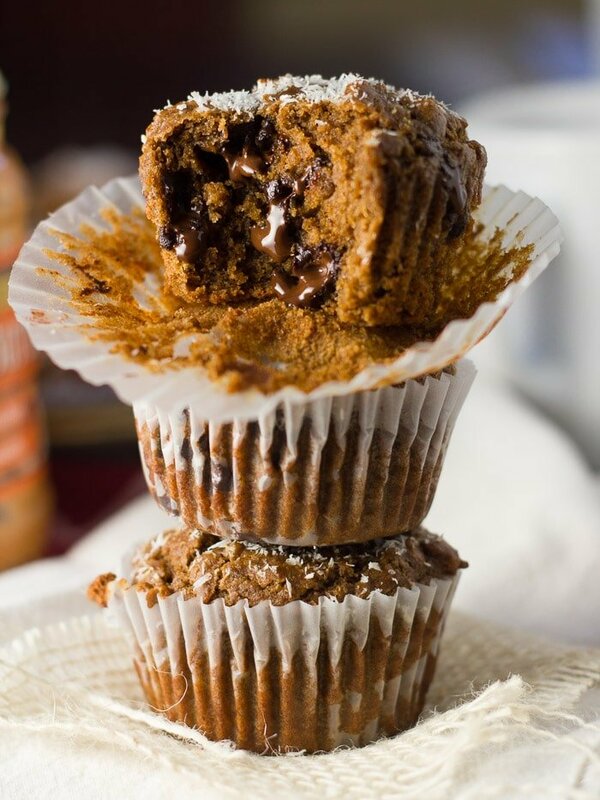 Made with creamy peanut butter, infused with spices, and studded with dark chocolate chips, these vegan blackstrap molasses muffins are sure to become an instant favorite! Okay, so I realize I constantly refer to new recipes as all-time favorites on this site. The fact that I do it all the time doesn’t make it not true. I’m just really enthusiastic about my food, and when I love a new recipe, it’s an instant favorite. Having said all that: these muffins are my favorite muffins ever. That includes all the vegan and non-vegan, healthy, sugar laden desserts-in-disguise and everything in between. They’ve even managed to surpass my vegan banana muffins, which is saying a lot. I’ve been working on this one for a while, though not intentionally. Some time around last spring I threw the first version of the recipe together, and I’ve been making and tweaking the recipe ever since. As a result of all of that, I’m pretty certain I’ve nailed down the best possible version. My first batch used almond butter instead of peanut butter, and that was good, but the peanut butter version is definitely better. Also, for some reason coconut oil works better than any other oil in this recipe, although you could go with some other neutral flavored baking oil if that’s what you’ve got on hand. Can you swap out the blackstrap molasses for regular molasses? Maybe. That’s one thing I haven’t tried, but I really love blackstrap, and I especially love the combination of blackstrap molasses and peanut butter. (If you do too, check out my breakfast cookies, which also feature that combo). If case you’re not familiar, blackstrap molasses is essentially super intense molasses. It’s also got some health benefits as compared to regular old molasses. You can possibly get it at the regular old supermarket, definitely at places like Whole Foods and Trader Joe’s, and if all else fails, get it on Amazon. Preheat oven to 350° and line a 12 cup muffin tin with papers. In a medium mixing bowl, stir together flour, sugar, baking powder, cinnamon, nutmeg, cloves and salt. In a separate bowl, stir together milk, peanut butter, molasses, coconut oil, and vanilla extract. Pour the wet mixture into the bowl with the dry ingredients and stir just until blended. Fold in chips. 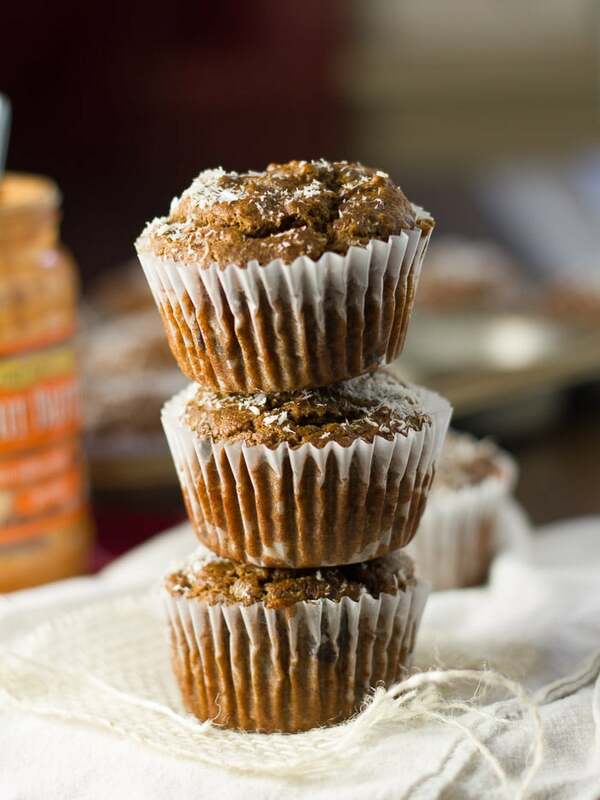 Divide batter into muffin cups and optionally sprinkle with coconut. Bake 20 to 22 minutes, until tops spring back when lightly touched. Transfer to a cooling rack and allow to cool for a bit before serving (but they're extra awesome when still a tad warm). These look amazing! 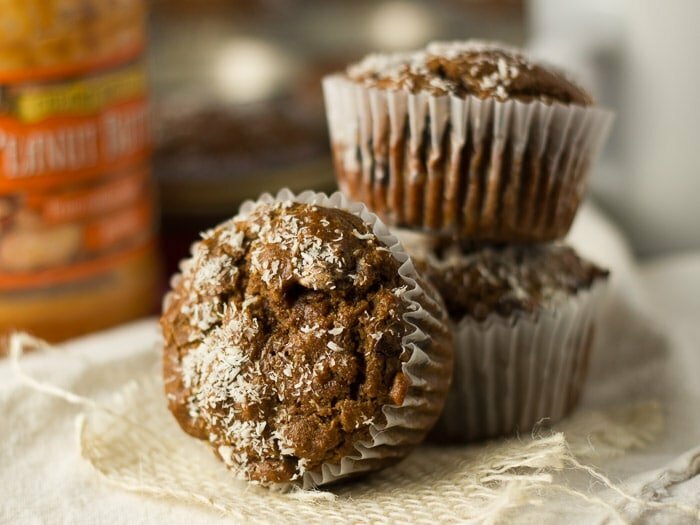 I’ve never tried making muffins with molasses- I can’t wait to try them out! :) Thanks! Thanks Beth! I hope you enjoy them! Very tasty batch of muffins. I took mine out of the oven at 18 minutes. The coconut was nicely toasted and knife came out clean (except for the chocolate gooey parts). I subbed whole wheat pastry flour for the spelt. I am on strict orders to limit myself to ten types of flour at any one time. Also used chocolate chunks rather than chips. These look delicious. I love the flavor combo of pb & blackstrap molasses. Will ap flour work in place of spelt flour? I don’t normally like muffins but now I really want to try these. Bring on the iron prowess of the blackstrap molasses! Can I replace the splet flour with a regular whole grain flour? I think whole wheat or all-purpose would work. I make these a lot! But I like to melt the chocolate into the batter. Its a gorgeous swing of taste with the peanutbutter. And I make them with wholegrain speltflour. They are so nutritious and they taste incredible! I’m so glad you like them! I’m all for adding chocolate to just about anything. :) I’ll probably try it myself next time I make these. Thanks Sari! I am able to use regular molasses instead of blackstrap? If you do they will probably be a bit sweeter. You might be able to do that and cut down on the sugar, but I can’t say by how much. Met again with the same brunch group I wowed with the lemon blueberry coffee cake and wanted to try something new. Since the last try was such a big hit I scrolled through your other recipes and I’m so glad I hit on this one! They turned out perfectly, moist and delicious! Everyone loved them. Thanks so much for making me look like a rock star to my friends. I’m not sure! It usually works but I haven’t tried it with this particular recipe. Please let me know if you try it! I tried substituting applesauce for coconut oil and it worked! But I also increased the peanut butter to 1/2 cup. Any issues expected if I use a gf blend or gf oat flour instead ? I haven’t tried, but I think that should work! I usually have luck in recipes like this with Bob’s Red Mill or King Arthur’s all-purpose gluten-free blends. Enjoy!! Hi! I love your recipes! I was wondering if I could use peanut butter powder instead of natural peanut butter. What do you think? And how much would you use in place of it? Thanks! Thank you! I’m afraid I’m not sure! I’ve never baked with powdered peanut butter. If I were to give it a try, I’d add some applesauce as well to replace the oil that’s naturally found in peanut butter. I’d love to hear how it works out if you try it!